So, here’s a challenge: How does a brewery satisfy its customers’ desires for something new, without necessarily requiring them to commit to a completely unknown experience? If you’ve been digging Firestone Walker Brewing Co.’s Luponic Distortion series, featuring a new hop variety each go-round, you may already have a pretty solid answer. Or maybe you’ve tried the first rendition of Stone Brewing’s Hop Revolver IPA—featuring the newish Loral hops—which dropped nationwide in late January in the brewery’s All IPA Mixed 12 Pack. Or Night Shift Brewing’s rotating-multi-hop Morph series, currently on Batch #43 and featuring Citra, Ella, Simcoe and Topaz. Or Burial Beer Co.’s Ceremonial Session IPA, now highlighting Vic Secret hops from Australia. The general formula? A familiar framework plus something new. 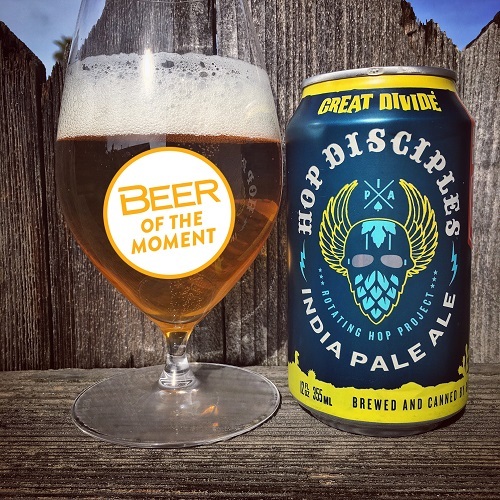 Great Divide recently released the brewery’s first iteration of Hop Disciples, a rotating-hops seasonal that will switch up its core hop on an annual basis. This year’s highlights the Idaho 7 variety, which garnered a good bit of attention since being formally released in 2015. Hop Disciples pours deep golden with a nice layer of foam, with loads of marmalade and candied lemon in the aromatics. The overall mouthfeel’s actually quite reminiscent of Firestone’s first Luponic Distortion: strongly emphasizing late hop additions, and arguably landing more like a pale ale. It’s also an ideal structure for a so-called “Rotating Hop Project,” with lean central maltiness and just a hint of caramelization. The Idaho 7 additions show an engaging balance between conventional citruses and more tropical, mango- and papaya-like notes. And, maybe most importantly, its overall form seems ideally poised to showcase another hop, next year. Expect to see many more breweries jump on the evolving-hop train this spring and summer. Great Divide’s Hop Disciples (2017) is available now through April in six-packs, half-barrels and sixtels. Like most beers emphasizing volatile hoppiness, enjoy these as fresh as possible. All About Beer Magazine’s Beer of the Moment series aims to find that compass heading in the endless sea of new beers. Whether classic or the current cutting edge, these are fresh releases that inspire, that challenge, that stand for something. They’re why we’re All About Beer.